Mini Maharashtrian thali (Pithla Zunka Thecha / Kharda Bhakri platter) was made for lunch. These traditional, simple recipes make a flavorful and nutritious meal. Missing in this rural food of mini maharashtrian thali are zunka, curd, green vegetables which was compensated with sprouts. 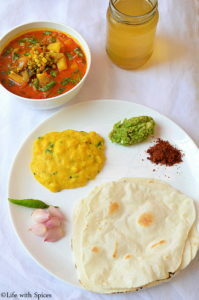 This mini Maharashtiran thali has Bhakri, pithla, mugachi bhaji, mirchi kharda and nimbu shikanji. Bhakri is a unleavened flat bread / roti made with any of these flours (rice flour, jowar flour, bajra flour, ragi flour) These guilt free flours are made in to pliable dough, rolled thin and cooked on a tawa and puffed up on direct heat. Pithla is made from besan / gram flour flavored with onion, garlic, green chillies and lots of hing. Mirchi Kharda is a chunky chutney type made with green chillies, garlic and peanuts. Mugachi bhaji is made of moong sprouts. 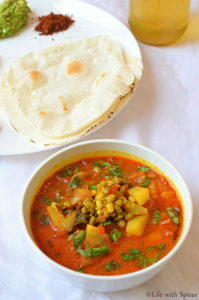 It's an easy to make classic dish which pairs well with Bhakri/ roti. Nimbu Shinkanji is a refreshing lemon drink made with shikanji masala. This meal platter was served with pickled onion, green chilli and Lehsun ki chutney. Mix flour and salt, add hot water and make into soft dough. Knead for atleast 5 minutes which makes it pilable. Roll the dough into thin bhakris, place on a hot tawa / pan cook for a minute turn it cook for a minute and allow to puff on direct flame. Apply ghee/butter and serve hot. Grind green chillies, garlic, peanuts, salt into a coarse paste. Heat oil in a pan add the ground paste, saute until the mixture thickens remove from heat and serve. Ina bowl add besan, turmeric powder, water mix well with out any lumps. In a a pan / kadai heat oil add mustard seeds allow to splutter, add green chillies, hing, onion, garlic and saute well. Add the gram flour batter, red chili powder,salt and keep stirring in medium heat. Cover and cook for 5 to 8 minutes or until the mixture thickens. Turn off the heat and add coriander mix it and serve hot. Heat oil in a pan add mustard once it splutters add curry leaves, turmeric powder, hing, onion and saute well. Add tomatoes, moong sprouts, potatoes, lahsun masala, salt, 1 cup water and simmer for 10 minutes. Check for potatoes if they are done, remove from heat sprinkle coriander and serve hot. Nimbu Shinkanji method: In a jar add 2 glasses chilled water, sugar, cumin powder, black salt, salt, lemon juice stir well add ice cubes and serve! !